This is an intensely active course, and is intended only for those who are serious about becoming exceptional leaders. While named “essentials” there’s nothing basic about this course. The Essentials is a unique leadership education experience you won‘t want to miss. 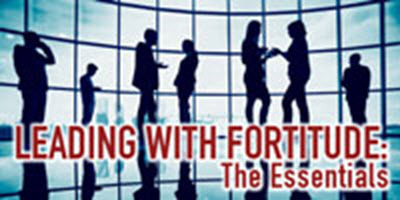 All Fortitude Leadership courses are developed with the knowledge that there are no born leaders. Leadership is taught. The truth is anyone can learn how to lead. And, anyone can be good on any given day, but being exceptional requires daily effort. Are you up for the challenge?